DEAR MAYO CLINIC: I am four months pregnant and live in an area where there has been a pertussis outbreak. What’s the best way to keep my newborn baby safe until he or she can get the vaccine? ANSWER: The best way to prevent your baby from getting pertussis, also known as whooping cough, is for you, while you are pregnant, to get a dose of the tetanus, diphtheria and acellular pertussis booster, or Tdap, ideally between 27 and 36 weeks of pregnancy. A recent study showed that when pregnant women receive the vaccine, it dramatically increases newborns’ immunity to pertussis — effectively protecting the infants until they start their own series of pertussis immunizations. Pertussis is a highly contagious bacterial respiratory infection that causes a severe, hacking cough and other complications, such as pneumonia. The coughing spells can be followed by a high-pitched intake of breath that sounds like a whoop and gives the illness its name. Coughing spasms can cause extreme fatigue and vomiting, and make it hard to breathe. Severe coughing spells also can create small hemorrhages in the eyes and brain. In babies, pertussis often is serious, because infants’ airways are so small. Therefore, they may have trouble breathing during coughing spells. When newborns get pertussis, about half require care in a hospital due to serious complications. About 1 percent of infants who get pertussis die. It is crucial that young infants be protected from this potentially life-threatening condition. In the past, it was thought that the only way to shield a newborn from pertussis was to keep him or her away from anyone who might have the infection until the baby had received the first series of pertussis shots given at 2, 4 and 6 months. Those vaccinations are still important. Ensure your child gets them on schedule. The pertussis vaccination is given in combination with tetanus and diphtheria vaccines. It’s abbreviated as DTaP for diphtheria, tetanus and acellular pertussis, and is a different strength than the adult vaccine booster, which is abbreviated Tdap. 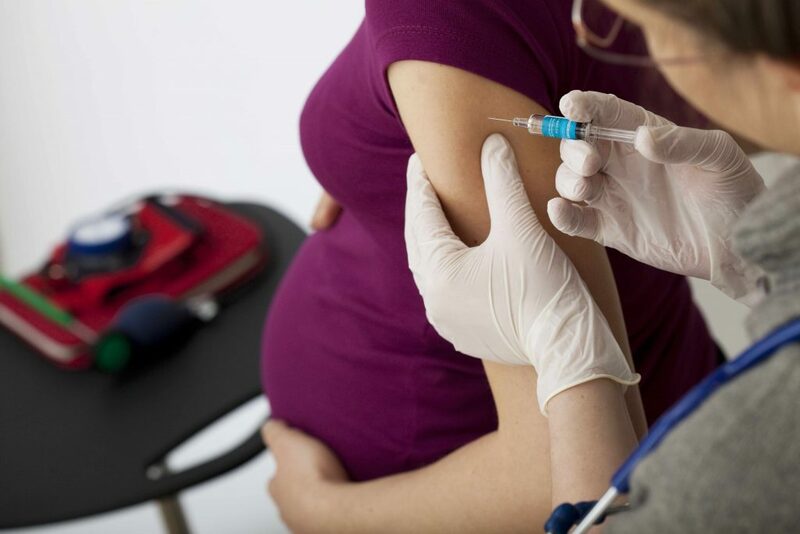 A recent study that included 150,000 infants showed clear health benefits for newborns when their mothers receive the Tdap vaccine during the third trimester. The research found that 90 percent of infants born to mothers who received the vaccine during pregnancy had full immunity against a pertussis infection during the first six months of their lives. That means the immunity the babies received from their mothers’ vaccine during pregnancy served as an effective bridge until they received their newborn DTaP vaccinations. When a mother is not immunized, her baby is vulnerable to pertussis infection until the infant receives the full course of three vaccinations. The Tdap vaccine is safe for pregnant women and their unborn babies. It does not raise your risk for complications during pregnancy. The vaccine does not contain any live bacteria, so you cannot get pertussis as a result of the vaccine. The most common side effects of the Tdap vaccine in adults are temporary tenderness, redness, swelling and pain at the site of the injection. Severe side effects from the Tdap vaccine are rare. To maintain your child’s immunity to pertussis as he or she grows, DTaP boosters are recommended at 12 to 18 months; 4 to 6 years; and again at age 11. A single pertussis booster shot is strongly recommended for all adolescents and adults, especially for anyone in close contact with infants, particularly during a pertussis outbreak. Women need to receive a pertussis booster vaccine with every pregnancy to protect the baby.